My first computer (1981-1983): I designed and built it using wire-wrap sockets on blank STD bus cards. The processor board featured a 1MHz 6502 processor, 1K bytes of onboard RAM, and a serial current-loop interface for a Teletype ASR-33. The backplane connecting the cards together was made from separate edge connectors mounted in a surplus card cage, all connected by individual hand-soldered wires. There were no front panel switches to enter a bootstrap program into RAM like an Altair or IMSAI, so I wrote a small monitor program that would let me enter data using the Teletype. I designed and built my own manual EPROM programmer so I could create a boot EPROM to hold the monitor program. Later hardware additions (all hand assembled using wire-wrap) included two 24K RAM expansion boards with battery backup, a serial I/O card for accessing a 300 baud modem and text mode video terminal, a floppy disk controller (for an 8 inch floppy drive which could hold an astounding 1 million bytes of data! ), an 8 bit audio I/O board, a MIDI interface, and three different computer controlled EPROM programmers. I later bought a real Vector backplane PC board and card cage to replace the hand wired setup. I also built the rack-mount case you see in the photo. The monitor program that I used had three basic functions: Allow hex data entry, dump out hex data again and execute a program. Programs were entered in machine language (not assembly, mind you). 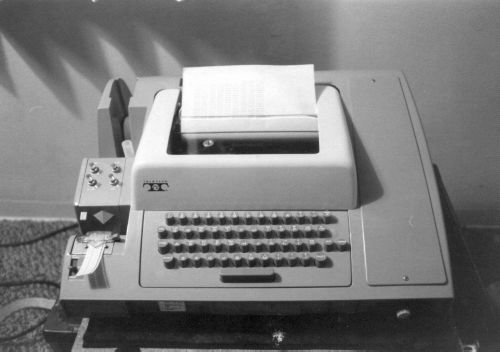 I would write out programs on paper and manually translate the op codes into hex machine code before typing it in with the teletype (and later a dumb video terminal). The hex dump format was the same as the hex input format, so after I entered a program manually, I could turn on the Teletype tape punch and dump it to paper tape, and then load it in at a later time by reading the tape with the Teletype tape reader. Some of the programs I wrote included a terminal program that allowed me to access computer bulletin board systems, an EPROM programming system for saving programs or data on EPROMs, an audio sampling and playback system, and various audio processing utilities. I still have the computer and it still works, though I no longer have the Teletype or rack-mount case.